Brown ground beef in a soup pot or Dutch oven; drain grease. Add in all the remaining ingredients cook over medium heat. Allow the chili to come to a boil. 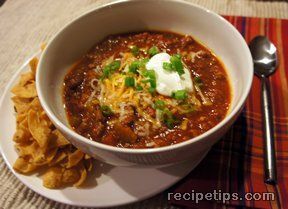 Once the chili is boiling, turn the heat to low and simmer for awhile to allow the flavor of all the ingredients to blend together.